A complete cast lead object probably a weight or gaming piece of uncertain date. It is rectangular in form and section. All surfaces are undecorated. 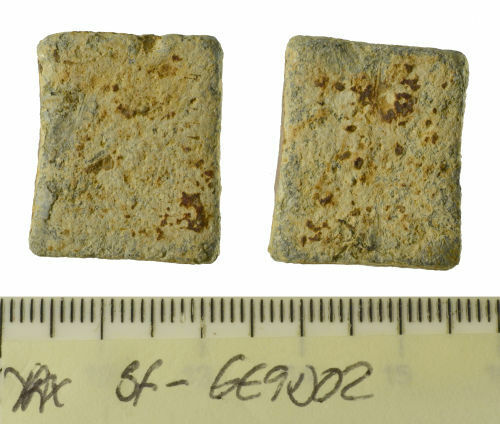 This object measures 22.85mm in length, 18.87mm in width, 6.65mm in thickness, 26.06g in weight. There are similar examples recorded on the PAS database (SF-EB7D11), (LON-6A4983), (NMS-7F64B5), (NMS-05E756). These all suggest a variety of dates, however a later date seems most likely, perhaps in the Medieval to Post-Medieval periods.